I’ve been reading books so quickly this month that I am now far behind with writing about them, so this is just a short post about an excellent new book by Mark Mills, published on 17 November. 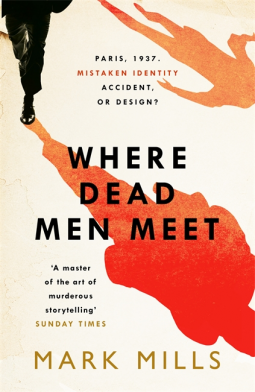 I’ve been meaning to read more of Mark Mills’ books ever since I read The Savage Garden in 2008, a book I enjoyed very much, so I was keen to read his latest book, Where Dead Men Meet. It is historical fiction set in 1937 in pre-Second World War Europe, with a fast-moving plot as Luke Hamilton, an intelligence officer at the British Embassy in Paris, tries to discover why someone wants him dead, why Sister Agnes, the nun who had been his mentor and guide at the orphanage for the first seven years of his life had been bludgeoned to death, and who his real parents were. Although the war in Europe is imminent it is by no means the main focus of this book, but forms an excellent backdrop as the action moves from Paris across the continent. At first he assumes that the assassin has mistaken him for someone else, but the tension builds as Luke realises that he is not the victim of a mistaken identity, but that someone is determined to kill him. He finds himself on the run, helped by a number of people, including the first man who tried to kill him. It seems the answers lie in his past. It is a complicated story that had me unsure of who Luke could trust and whether he would ever escape, or find out about his real family. I thoroughly enjoyed this brilliant book with its interesting characters and a convincing plot full of mystery and intrigue. I shall now look out for more books by Mark Mills. I received a copy of this book from the publisher, via NetGalley, for review. It certainly sounds like it has a strong, solid pace and an interesting backdrop, Margaret. Little wonder that you enjoyed it so well. And I do enjoy historical novels…. thanks for sharing. The setting (Europe between the Wars) is one I particularly enjoy. Thanks for the recommendation!